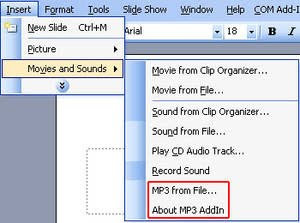 Microsoft Office users can’t embed Mp3 files in their PowerPoint presentation.Its because PowerPoint requires the WAV sound file format to be embedded.This problem is easily solved my using MP3 AddIn. After installing this Mp3 AddIn its possible to insert MP3 files without converting them in a difficult way with external tools to the WAV file format.MP3 AddIn automatically converts the files by changing the name of the MP3 file and Powerpoint deals with it as if it were a WAV file, letting you easily embed MP3 files into PowerPoint presentations for free. Many PowerPoint users will feel adding MP3 will make their presentation effective.MP3 AddIn is a lightweight application and does not occupy much space. No need to attach MP3 files while sending them to friends.